Haring Township is now able to offer residents a new online service to allow access to property tax information. By clicking on the link below, a resident can view information for their own property at no cost. The Charter Township of Haring is located north of Cadillac Michigan in Wexford County. The Township Offices are located at 515 Bell Ave. next to the fire station. This is the polling location where all voting is done in the township. 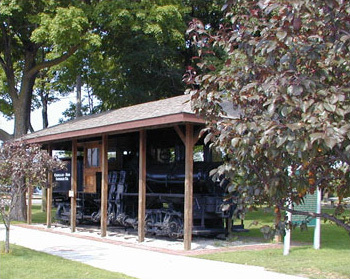 The Shay Locomotive, first built in Haring Township, is on display in Cadillac City Park. Office hours are from 9 a.m.-1.pm. Mon.-Fri.
Absentee ballots are available per request. No reason is necessary. The Charter Township of Haring Planning Commission will meet at 7:00 P.M. on the Tues following the regular board meeting of each month. Organizational Meeting March 5, 2019 9:00 A.M. The second Monday of March, March 11, 2019 9:00 A.M. – 3:00 P.M.
Tuesday - March 12, 2019 3:00 P.M. - 9:00 P.M.
and the Tuesday following the second Monday in December (the 9th) to review and correct and clerical errors.